and give some good examples of the most popular beads. The Multi-Faceted, Round, and Bicone Shapes are the most popular for making rosaries which may be offered for sale or for gifts. Most of the shapes are widely available in plastic, glass, and crystal. Heishi (hee-shee) The literal meaning of heishi is "shell" and specifically refers to pieces of shell which have been drilled and ground into beads. 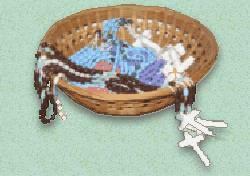 Rondelles and Seed Beads Used as separators between beads, these comes in a wide variety of shapes, sizes and colors. Crimp Beads Tiny metal, hollow beads, used to separate beads and finish off ends on bracelets and cord rosaries. A special Tool is required for applying Crimp beads. Aurora Borealis is a sparkling finish usually applied to crystal beads, but may also be found on some glass beads. Fiber Optics are beautiful beads, and the name refers to the process of blending the colors. They have almost a pearly sheen to them. They are available in glass and Lucite, a very hard plastic. These are sometimes mistakenly referred to as "cat's eye" when offered in brown or a darker color. Fire Polished beads give the same appearance as the aurora borealis but are usually less costly; the beads sparkle and shine and reflect light more readily than plain glass beads. Metal Beads come in a variety of finishes, from glossy to matte, silver, gold and platinum. Some are made from actual precious metal over brass, but metal-look beads are also widely available in plastic. Beware of what you are buying as prices will vary drastically. Miracle Bead - A heavy coat of lacquer makes these beads appear to glow from within. Usually more costly than Fiber Optic beads. Vitrail is the appearance of a bead after a metal sulphate has been applied to the surface. Often called "stained-glass," vitrail beads give off a multi-colored sparkling sheen. Wood Beads come in a variety of colors and finishes, the most popular and affordable being olive wood beads. Note: the holes drilled in wooden beads is often larger than that of plastic or glass beads. You will have to adjust the size of your eye pin closure accordingly. Crystal is defined as a solid formed by the solidification of a chemical and having a highly regular atomic structure, while glass is a brittle transparent solid with irregular atomic structure. The key to crystal is it's perfect shape, and weight. For more than 100 years Swarovski crystals have been famous for their exceptional quality and clarity. Swavorski is a brand-name of Austrian Crystal. Both the Czech crystal and the Austrian crystal are equally as bright. The Austrian colors are more intense. The Austrian facets have sharper edges. Crystal beads cost more than glass, but if you are looking to create a fine rosary, weighty, and with perfect clarity, choose crystal over glass. Lamp Beads are hand-made and will be among some of the most expensive beads you will find, 50 cents to $1.00 plus, per bead. These beads are usually made of glass, and are hand-painted, but give the appearance of a precious stone, such as the cats eye shown above. Use 6 of these beads for the Paters to make a truly special rosary. Oval and other oblong shaped beads are offered in " W x L " sizes such as 4 x 7 mm. The first number is the width; the second the length. Order your beads by length size. Round beads and near-round beads are offered in "X" size mm. Order your round beads by diameter size, such as 8mm. Sometimes, beads are sold by the strand. For best value, buy your beads by the stand. Enamel Colored, opaque glassy material fused onto metal, pottery or glass. In its simplest terms, all enamel is produced by fusing colored powdered glass to metal to produce a vitreous or glass-like, decorative surface. Etched Very faintly carved decoration scratched onto the surface of a piece. Facet Facets are the small flat surfaces of a glass, crystal or gemstone bead. These polished, flat planes are a major determining factor in enhancing the bead's ability to sparkle or reflect light. A Faceted bead or gemstone carved with a regular pattern of many planes, or "facets". Gemstone A precious or semiprecious stone that may be used as a jewel when cut and polished. Include diamond, beryl, emerald, chalcedony, agate, onyx, tourmaline, chrysolite, sapphire, ruby, spinel, topaz, turquoise, zircon, cubic zirconia, jacinth, hyacinth, carbuncle, amethyst, alexandrite, cat's eye, bloodstone, hematite, jasper, moonstone, sunstone, and many others. Laminated An object coated with a thin layer of plastic is said to be laminated. Opaque A substance which is not transparent or translucent. i.e. a substance that does not allow light to pass through it. Precious Stones Rare and costly gems such as diamonds, emeralds, rubies, and sapphires. Retail You pay a merchant's full retail price for beads and supplies. Semi-Precious Stones They are natural stones including amethyst, aventurine, carnelian, garnet, opal, rose quartz, and so on. . . used in fine rosaries, and may be referred to as Gemstones. Translucent Allowing light to pass through, but not transparent. Transparent A substance that allows light to pass through it easily and objects placed on the back can be fully seen through the substance. Wholesale The sale of goods in large bulk or quantity for resale by a retailer or jobber rather than directly to consumers. 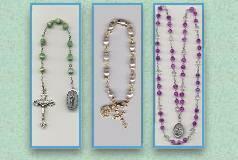 A Rosary makers best value for beads and findings.